Pictograms <-- You Are Here! Watch Simon Miles Bases Lecture on his recognition of the basic association of the Crop Circles. And refer to the topic of this Wiki Site Abstraction Physics to best understand how these pictograms are used here to express human focus and interaction between the conscious mind, subconscious and body clock. He clearly places/associates the flower of life and pi crop circles on the 1991 Barbury crop circle. The Menorah he orients on the 1991 cc but should be turned to line up with the third part of 1991, as the initial setting. There is intent to turn, depending on user accessed interface & focus. Place-value, resolution, and recursion. In this case, the resolution is "6" (flower of life with six petals/positions), the recursion is expressed as pi (pi cc) being that it is infinite as is pi calculated. Additionally, the pi cc has an association with both the rings of the 1991 cc and scarab position. The Menorah, seven flames as there are seven action constants of abstraction physics (ten total. Note: pi cc is calculated to ten places). There are three additional nodes on the menorah. Abstraction physics has two of the ten as just settings for where input and output are set. The remaining one of the ten represents definitions (inherent in the use of the nine). 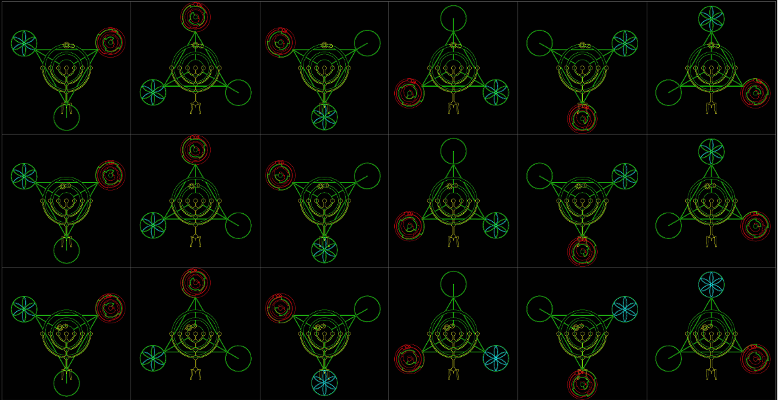 The nodes on the menorah are placeholders for the action constants of abstraction physics. Configured as needed. There is the scarab & base of the menorah. The base being the user and what interface(s) they are accessing (in this case: place-value), the scarab being the users point of focus. When between two of the 1991 cc triangle points, the user accessed interface or focus is on the relationship of the two it is between. Food for thought: Flower of life (upper left) = Physical Reality; Pi (upper right) = Recursion; bottom center = Abstraction. What side might disconnection from physical reality happen? The following image links will open a new tab for each (broken - use right mouse button to open links). By zooming your tab windows the same you can click on the tabs to see something of an animation. The links are relative in position to the overview above. The reason for the position of CC1 being the first in the set is to give emphasis on the human ability to abstract. In position CC6, CC12 & CC18, the individual is considering abstraction and recursion in their perception of physical reality. What they then communicate in an abstract form about reality to others is inherently limited to the receivers abstract definition and its association to physical reality. There is a translation that takes place. It is in the abstract translation where misdirection can occur.